Beautiful You: Meeting One Direction | You Did What?! Meeting One Direction | You Did What?! As some of you may know if you read yesterday's post I have had the most craziest week ever but it has probably also been the best week ever. Seen as I enjoyed it so much and it was probably the best day of my life I thought that I would share it with you all, I know there are a few of you who will appreciate this a lot! 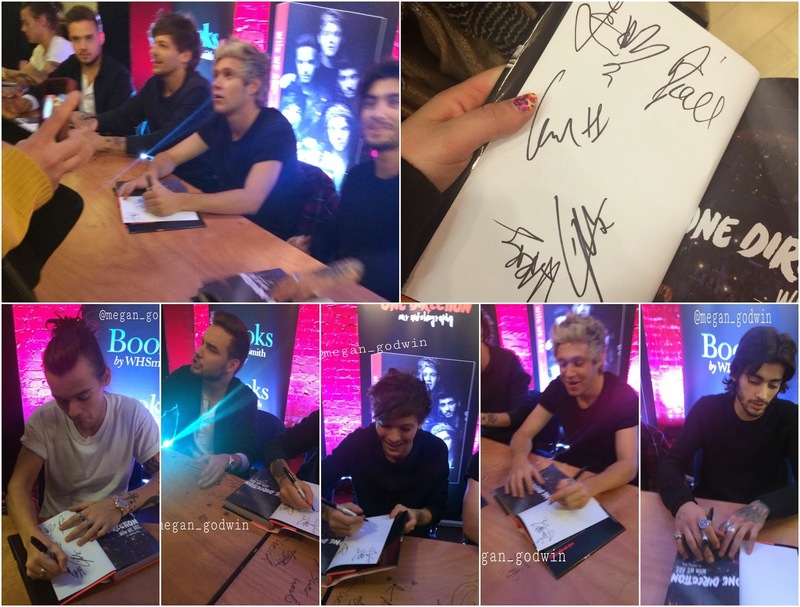 On Monday night at 6pm One Direction announced that they were doing a secret book signing in London on the following Wednesday and I was lucky enough to get 2 tickets! Seen as I was in Bournemouth I had to get back to Swindon so that me and my sister could then travel to London on the Wednesday. We arrived just after midday and we headed to Covent Garden to get some lunch in Costa and to charge my phone, definitely didn't want that to die! Then we have a look round at the Christmas decorations before we headed to where the signing was. We arrived at the venue at about twenty five to four and we got inside just after four. Whilst we were in the queue waiting we met four american girls that are studying here for a semester and they were so lovely. We stuck together from then on and we were waiting in the queue until about quarter to seven and that was when my life was made. We walked into the room and I literally couldn't talk, they were all sat in a row and they all looked amazing. The order went Zayn, Niall, Louis, Liam and then Harry and I'm so glad he was last otherwise I wouldn't have been able to cope. I literally cannot remember anything that I said to the others because the main thing that I remember was when Harry handed me my book personally and then wishes me Merry Christmas. After this I definitely had to get out of there because I could have died, I will put a collage in here of all of them and the book so you can see! But there you have it that is what I got up to the week and why I have been so busy and not on my blog. Like I said in my last post I am going to be getting back into blogging as I am now home for Christmas and I will have more time to spend on my posts. I hope you are all well and you like this post and I will see you all on Monday! I'm so jealous!!!!! Happy christmas. Autumn Leaves: blogging tips, product reviews and unique content!